The latest numbers from research firm Gartner reveal that the smartphone industry continues to be a virtual two-horse race between iOS and Android. 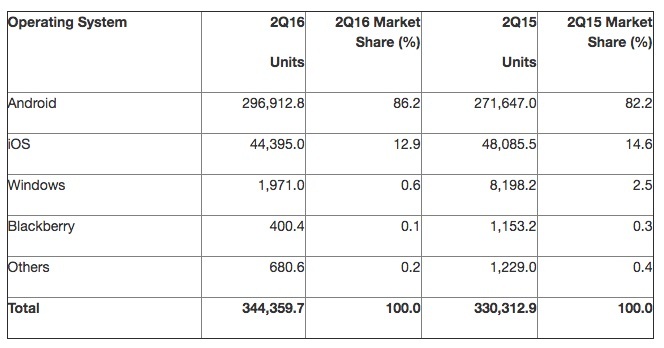 The operating systems combined for a record 99.1% worldwide market share in the second calendar quarter of 2016, compared to 96.8% in the year-ago period. Android remained the world's most widely used smartphone operating system with 86.2% market share in the second quarter, up from 82.2% a year ago, while iOS dropped to 12.9% market share from 14.6% in the year-ago period. Windows and BlackBerry smartphones continued their long-running descent, dropping to 0.6% and 0.1% market share worldwide respectively. iOS and Android achieving a 99% duopoly in the smartphone market is remarkable given that Symbian and BlackBerry operating systems were industry leaders just six years ago. Symbian was used by several major mobile phone vendors, including Nokia, Samsung, Motorola, and Sony Ericsson. Symbian was essentially discontinued in 2012, beyond being used on a few regional smartphones in Japan, while BlackBerry released its first Android smartphone last year. Meanwhile, Microsoft scaled back its Windows Phone efforts earlier this year following continuously poor sales of Lumia devices. Android has come a long away. I believe this year will be the 1st year I buy an Android phone because of the lack of innovation from Apple and the iPhone 7. Alternate headline: iOS continues to lose marketshare to Android. Significantly: Android gained 4% of the market, while Apple lost 1.7% of the market. At what point do developers stop making apps for iOS? Wasn't that the issue the Mac had in the 1990's, a smaller and smaller market share, so developers abandon it? Developers make 4x from iOS apps vs. Android. The vast majority of people choosing* Android don't spend a dime on apps nor services. Apple's iOS strategy is no different from the Mac's: skim the customers creme, enjoy the high margins and spend more on customer service. You can't beat iOS. *EDIT: they don't actually "choose": they pick the lowest priced item, and it's not an iPhone. I have the iPhone 6s Plus, I just bought the Nexus 6P to try Android. The phone was inexpensive as it was less that half what I paid for my iPhone. Slightly larger screen at 5.7, and crazy clear/sharp. The operating system was very surprising, I downloaded Android 7.0 and IOS 10. I was surprised how much more I preferred Android. Downloaded all the same Apps, I have to say I am sold! I just placed my order for a Note 7. I'm sold on Android and decided to get a phone far more advanced than iPhone. I'm shocked Android is so much nicer and the broad range of high end phones. I thought Apple was king. I strangely feel bad as I am a real Apple fan, have been for 18 years. Crazy how quickly Windows phone has just died completely. Microsoft really has seemed to have given up. I'm curious. What innovations do Android phones have that iOS do not? I'm curious because I do not know. Am I missing something? I also like the LED notifications on phones, call me old fashioned, but I can glance at it without activating the screen to see if there are alerts. Different colours for different apps. Apple is failing big time. I've been selling iOS apps since 2008 as a small independent, but Apple has kicked off their own death spiral by forcing stupid terms on developers (family share, feature or bury/die). They should dump the captive app store and let us sell directly on the platform (like OS X). It's really their last chance to save themselves. I also do freelance work for larger companies. Everyone wants Android now - even industries that never did before. And they want it cheap so they don't care about platform differentiation and will do without whatever new bell or whistle is available on whatever platform. All smartphone platforms have arrived at a sufficient level of "functionality parity" so yes, developers are switching to cross platform (write once) implementation to deliver on all platforms. I just realized I need to buy a windows PC to stay in business, which is actually good because now I no longer need to care about the next "Mac Pro". And the final nail in the coffin is the Lightning connector. I just finished a "proof of concept" app for a customer working on a hardware device. But the project is not going anywhere because it can't be commercially viable because of the need to do a USB-C AND a Lightning version. I also have MFI experience - it's worse than app store red tape. 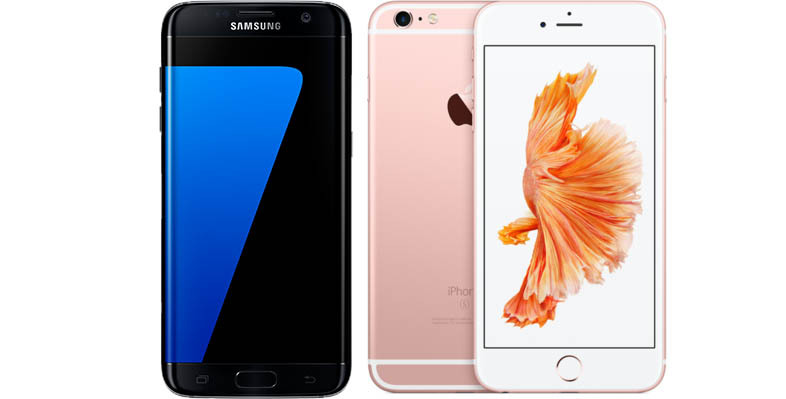 The smartphone industry is now a commodity industry. Apple is trying hard to be the "Gucci Smartphone", but you don't see the young hipsters featured in their emotional marketing ads shopping on Rodeo Drive, do you? Yep, Apple is doing "Mac" all over again with iOS devices. I've noticed shift from developers paying more and more attention on Android and essentially shifting the main focus from iOS to Android. Sooner or later Apple needs make some drastic moves with iOS devices if they want to stay relevant.